Today sees the Royal Liverpool Philharmonic Orchestra giving the world premiere of another work. This time by the prolific film music composer Michael Nyman. The symphony is dedicated to the memory of the ninety-six victims (and their families) of the infamous Hillsborough football stadium disaster. 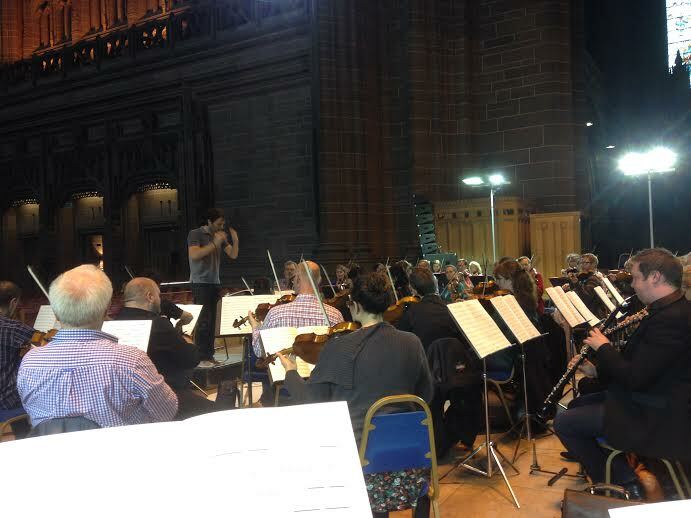 RLPO rehearsing for the premiere of Michael Nyman’s new ‘Hillsborough Symphony’. We will be giving two performances of the symphony today. The evening one for the general public and a special performance in the afternoon for the families of the victims. Conducted by Josep Vincent, featuring local mezzo-soprano Kathryn Rudge, the RLPO and the massed Liverpool Philharmonic Training & Youth Choirs. The concert is being given as a major part of the Liverpool International Biennial 2014 festival of contemporary art. 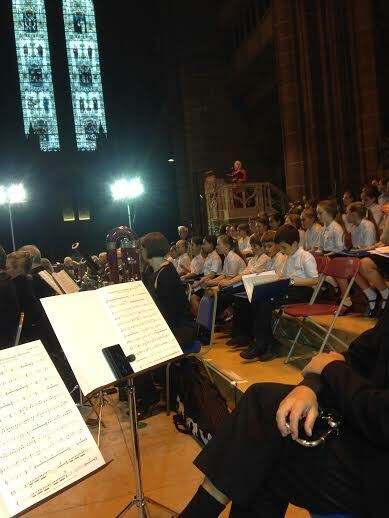 This entry was posted in The Tour Blogs & Brendan's Solo Blogs and tagged "Royal Liverpool Philharmonic Orchestra", 'RLPO', 2014, 96, anglican, art, biennial, cathedral, choir, choirs, contemporary, Festival, Hillsborough, international, josep, kathryn, liverpool, michael, Nyman, of, orchestra, philharmonic, royal, rudge, symphony, tragedy, training, victims, Vincent, youth. Bookmark the permalink.